Gluten is wheat protein and forms the basis for many of the vegetarian ‘meat substitutes’ such as sausages, mince and burgers. 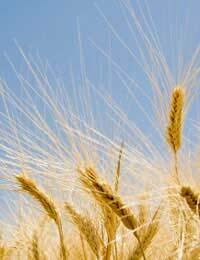 It is present in most types of commercially available flours, including spelt, barley and rye though not corn. There are several different reasons why people might wish to follow a gluten-free diet. Coeliac disease is an autoimmune disorder where the combination of gluten with digestive enzymes is recognised by the body as a threat, causing sometimes very serious reactions. Wheat allergy is a distinct condition more similar in nature to other allergies in the kind of immune response it provokes. Diabetes makes a sufferer unable to effectively regulate the breakdown of starches to sugar in the body, causing potentially dangerous fluctuations in blood sugar. Foods with high gluten content such as bread and pasta also have a high glycaemic index, meaning that the starch they contain is turned into sugar very quickly by the body rendering them unsuitable for many diabetics. So there are several compelling health-related reasons why some people have to avoid eating gluten or wheat. Despite this, gluten-free food is often perceived as a fad diet and as a result, it can be very difficult for those who need to avoid gluten to get their concerns taken seriously by food manufacturers or harassed restaurant kitchens. Where gluten-free pastas can be very useful is when cooking for a large number of people, some of whom are on a gluten-free diet and some of whom are not. Separate pots of wheat and non-wheat pasta can be cooked and the sauce combined with each, allowing for all the diners to eat more or less the same thing. Unfortunately, the durum wheat in traditional pasta holds together much better once cooked whereas wheat-free versions tend to break up quickly and messily. Many other cereals are completely gluten-free and can be used to make flour for baking or just cooked as they are. Millet is excellent for providing some body to soups or stews. Polenta, made from cornmeal, is a starchy food with no gluten. There are many types of gluten-free flour available, from the commonly available such as rice flour and potato flour, to the more interesting such as chestnut, buckwheat and amaranth. Gluten-free panbread made with these can be every bit as delicious as the wheat alternative. The most recent research seems to indicate that oats should be acceptable for coeliacs as long as they have not become contaminated with wheat flour during processing. Quinoa was once the staple foodstuff of the Inca civilisation and is a complete protein, meaning that it contains all eight of the amino acids that the human body requires. This makes it a great addition to any vegetarian gluten-free diet. It is cooked and served like rice – boiled in a pot – and can be easily stir-fried. It can be eaten hot or cold and can be used in place of bulgar wheat in tabbouleh or in any North African dish in place of couscous. A huge proportion of pre-packaged snack foods.